Want to give a unique gift to kids that will spark their creative juices and encourage growth mindset? I have the perfect idea for you! We love games at the holidays, and this year I am trying something a little bit different with my gift guides. A make your own game kit! 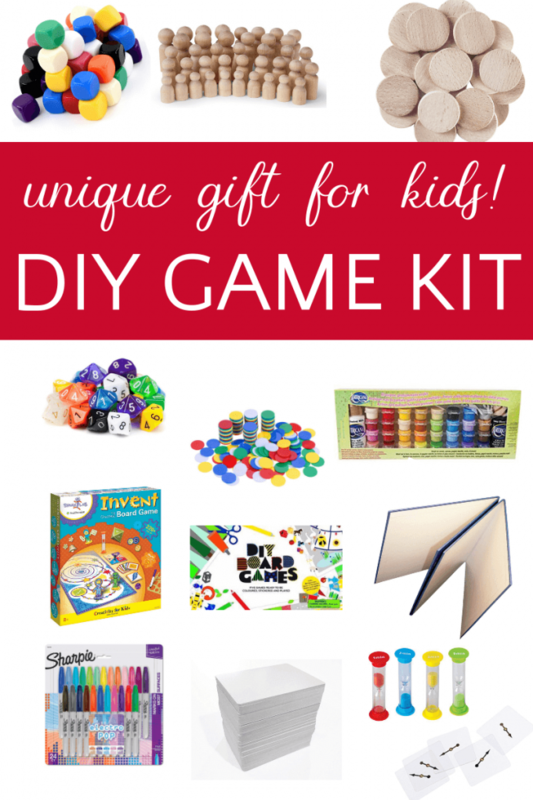 It can be a DIY board game kit or all the fixings for a card game! Inspire your kids to invent their own card, board, or dice games with these open-ended game pieces. I’ve also curated all these items, plus more, including “meeples” on an easy to use list over at Amazon. Meeples! Click here to see the guide plus all the extras. Blank deck of cards. Be sure to include a set of permanent markers. What will they make? A standard deck of 52 cards? A whimsical deck? Maybe they will design a specialized deck for a board game they are inventing! The sky is the limit. Multicolored and multi-sided dice. What’s more fun that a quick dice game with a standard set of 6-sided dice? Why a self-invented dice game using a 10 sided (or more) set of dice! You can get dice in all shapes and sized to inspire kids to roll away! Blank dice! Kids can use Sharpies to write numbers, letters or even draw pictures on each side. Alternatively, use stickers to decorate each side. We love having lots of colored dice so everyone can have their own set during game play. The kids always like having their favorite colors. Blank Game Boards are essential for creating your own board games, of course! Spinners. What I love about these transparent spinners is you can use a dry erase marker to change up how you want to use them. Chips come in very handy. You can make your own with small wooden discs and paint them the color you want. Alternatively, colored plastic chips are easy to come by and if you want to get really fancy, a box of poker chips will last forever. My kids love using our poker chips for all sorts of activities. Make pawns out of wooden game dolls! A colorful paint set will inspire your children to design their own pawns to be used in any game. Perhaps they will paint pawns to represent the family. So cute. Wooden discs that can be painted also come in handy as game tokens. If you’ve watched any of our game videos, you may have seen our homemade ones. Maybe you’d rather buy a complete kit to inspire your children to make their own board game. There are several available that look like a lot of fun. Invent the Greatest Board Game, kit from Smithsonian Spark Lab! 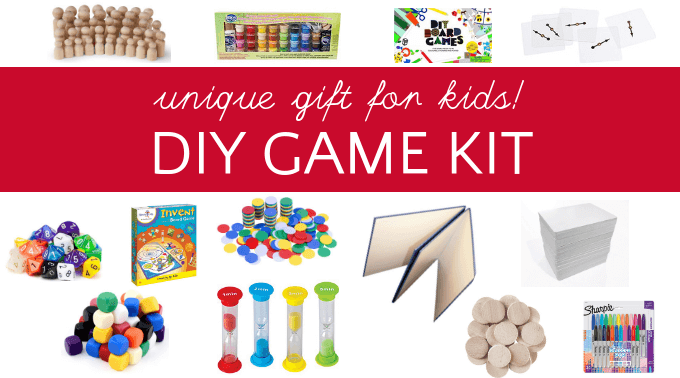 This kit includes a blank board, game tokens, stickers, a spinner, timer, dry erase markers and more. DIY Board Games. This set is not so much an “invent your own games” but rather a “put together your own games” set. There are five boards with stickers and pieces to assemble to play popular traditional games like Snakes and Ladders and The Great Game of the Goose. Don’t forget to check out the full curated list of items here. What an amazing idea! I was struggling with a gift idea for my crafty 9 year old daughter. She loves games. This is genius! Thank you! I am so excited about this list! My daughter absolutely loves making her own games. I’m getting her just about everything on this list!